Technology never remains same and it always upgrades further for the betterment. Thus being an Android app development company, you constantly need to upgrade yourself, in order to maintain the momentum of constantly evolving app technology standards. It is indeed a challenging task, since getting a miss on the technology forefront; you end up losing your mobile app to your competitors who integrate the best and the latest technology advancements in their app development process. So you need to be more attentive and read and explore the latest technology information to keep yourself abreast with the technology advancements, and our posts serve your purpose well. Enhancement of Kotlin– The most surprising and the mesmerizing announcement which has made the way to Android development process is the improvement of Kotlin. Now, Android app developers can utilize the ART, D8, and R8 technical fragments, which would reduce the annotation coverage and as a consequence the APIs can be used efficiently. Also, the Android Test would receive the best Kotlin Support, wherein the new APIs have been designed to increase the readability factor. Frameworks– Every Android developer looks for the better ways to mock the Android frameworks, but it has not been an easier task, but with the latest update now it would be cake-walk for the app developers to simply mock the final and static methods. Adaptive Battery– Google has given a shot to improve the battery life through optimization, this step is taken along with the Deep Mind and it is designed in a way to draw the power to applications. With this new feature, Android P would assess the usage and would push the background processes to low-power cores for the optimized battery consumption. App Standby Bucket- This feature is designed on Android platform for the maintained battery consumption, and it bifurcates the mobile apps as per their usage category. Restrictions For Security- Google has taken the security measures little more seriously and with the latest Android updates any mobile app would be restricted to utilize the camera, microphone and rotary sensor in the Smartphone background. Redesigned Launcher– It is built with the gesture-based navigation system, wherein the swiping up from the bottom of the phone screen would take the user to the recently opened apps. This feature is integrated with the AI technology- carousel, which would give you the suggestions based on your usage habits. Android Dashboard- In order to control the average spending time on the phone, Google has come up with Android dashboard, which shows the users the information about how much they have been using their phone. Text Measurement – We cannot deny the fact that text measurement requires resources and is slightly expensive as well. Now Google has come with a solution for this issue, and the text measurement will take place in the background with the help of pre-computed text, which would save the time and the resources both. A Relief For The App Designers – Now the Android app designers no need to juggle with the placement of the baselines of App Pages at a specific distance, because now the Android ToolKit would manage the baseline distance handling by itself. Short-Cuts With App Actions And Slices- We all adore the short-cuts and if the short-cuts can happen with the OS we all use, would be a blessing. With the App Actions and Slices, now Android users can move to any specific section of the app from anywhere on the phone. This set of features is handled by the ML, through which an algorithm explores the pattern of user behavior. Get Notified Smartly – With the new Android update, the notification algorithm would take a note of the users’ engagement pattern with a notification, which would shut the notification automatically for the users, if they are not reading it. Android P– Although in the Beta mode, but Android P has remained the constant center of attraction at the Google I/O 2018, and it showcased clearly that Android P would too much dwell with the Machine learning and it will also utilize the AI in many different but interesting ways. 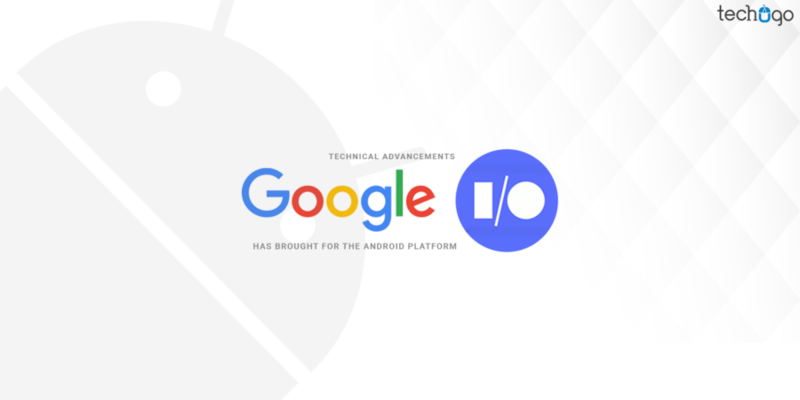 Android is one of the sought-after OS used worldwide, by a larger audience base and with the Google I/O 2018, it has been made clear that the NEW Android platform would drive the world towards a digital haven, which Google has called as the Digital Wellbeing and this attempt from Google would surely carve a niche for the users and the developers in the development spectrum of the Android platform. Now, every Android app development company must utilize these features and the technology advancements to compliment their mobile apps, so the users can avail the best possible technologies for their further convenience. On the other hand if you are looking for a leading Android app development company to help you build a successful Android mobile app fitting the latest Android advancements then you must get in touch with Techugo, which holds the brilliance and the extensive experience of developing the latest technology infused mobile apps for the different business verticals and industries across the globe. So get in touch with Techugo today and help your business to get its deserving recognition.